You may have noticed the use of the term “natural flavors” in processed and packaged foods if you look at the ingredient’s list (which you should!!) 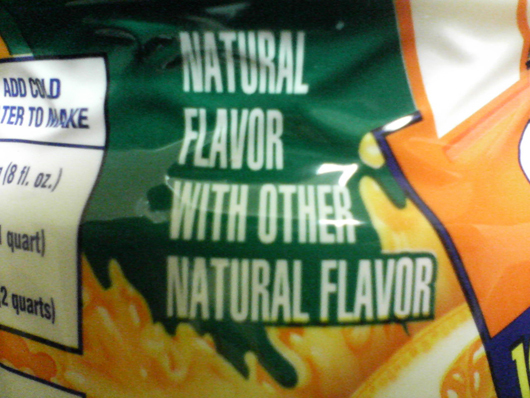 Well “natural flavors” are not as innocent as it may sound. Foods that are labeled organic, vegetarian, or vegan do not have to follow that label for “natural flavors”. “Natural flavors” can be derived from plant or animal “matter”. So your organic vegan soup, cookie, or whatever could contain animal products disguised in the form of “natural flavor”. MSG, aspartame, and bugs are all considered “natural flavors” and “natural colors” that can be found in your food. I recommend that you read the article above and eliminate foods that have “natural flavors” from your diet whenever possible. Below is an excerpt from two articles that FoodBabe wrote about “natural flavors” too. If you haven’t read her blog before I highly recommend you check it out too! She investigates what is really in our food, and she provides some recipes along the way. “The natural and artificial chemicals that flavor manufactures engineer are contributing to what David Kessler (former head of the FDA) calls a “food carnival” in your mouth. The inability to stop eating because the flavors they have synthesized trick your mind into wanting more and more. They don’t want you to have the full essence of the strawberry – they want you to only experience the best 1 millionth part of the taste – so you get “addicted” and keep having to go back for more and more, searching continuously for gratification – eating more of that product which in turns fills Big Food Companies pockets. The Big Food Companies are “hijacking” your taste buds one by one.